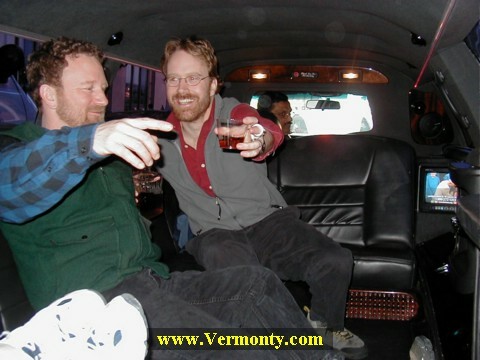 Originally conceived as a play, "The Full VerMonty", a Vermont spoof of the "Full Monty", in Jan. 1999, the play was never finished, nor performed because of our stage at the Maple Corner Community Center being shut down for fire code reasons. This year the idea was revived as a calendar to raise more money for additional repairs to the building. Our original goal was to sell 500 calendars, with hopes of maybe reaching 2000 in sales. On Thursday, October 18th we got a call from the Tonight Show , yes, that's the one with Jay Leno, in L.A., California, asking us for more information about our project. Take a look at some of the interesting things that have been sent to us. Oct. 20, 2001 - Lewis F. performs his new song about the calendar for the first time in public - "Let Us Bare Our A**es Nevermore", later rewritten as "The Men of Maple Corner Theme Song". Oct. 22, 2001 - We have been getting so many phone calls about the Calendar that we had to get a new phone line installed to handle it. I guess this is good news? 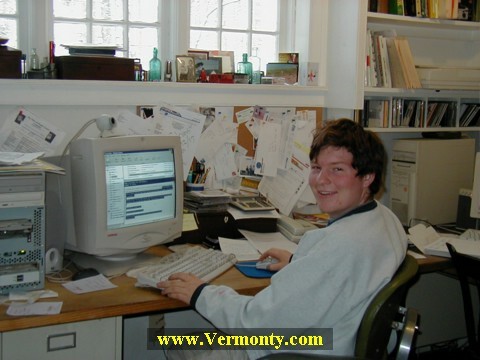 Oct. 24, 2001 - Recommendation by a lawyer is that we do not use the name "The Full VerMonty" as the name of the calendar, because it infringes on a trademark owned by 20th Century Fox. who owns "The Full Monty" movie. They don't want us to use the name unless we agree to certain restrictions about publicizing the calendar. We talked about different names to use, but it is supposed to go to the printer this week. Arrggh!! We got all the guys together after work and took the last of the photos, including retakes of the group photos. Finished picking the best shots, almost ready for the printer. Oct. 26, 2001 - Twisted Sister lead singer interviews "Mr. February"on the air. Article published in USA Today, page 1 of the Life Section, under the "Trends & Phenomena Dept. Anson Tebbetts just called to say that wcax fed the film to CNN, and it will be aired sometime between 6 p.m. and 10 p.m. tonight. The calendar was on the Regis show Friday morning, and they showed the canoe photo. Oct. 27, 2001 - Calendar featured on "Music to go to the Dump by" WDEV in Waterbury, Vermont. A great interview with Don H. - "Mr. April"
The Today Show called, and they want to come to Maple Corner to film us here. The date is not set yet, but could be soon. Oct. 28, 2001 - Rehearsal of Lewis' song (with new lyrics). Vt Public Radio's Neal Charnoff is coming to the Community Center this afternoon at 2pm to do a feature on us as we rehearse the song. We don't know yet when it will be broadcast. Oct. 31, 2001 - Official statement released - "Why we changed our name" and another newspaper article on this subject by the Times Argus. Nov. 2, 2001 - Radio interview with the 2 dorks, Dwyers & Michaels from Davenport, Iowa. We now have sales in 35 states and 4 foreign countries:Canada, New Zealand, Japan, and Germany. 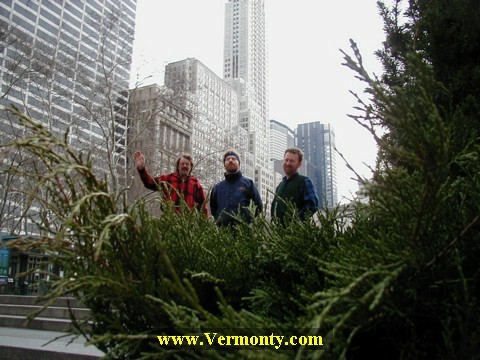 Nov. 3 - WVPR (Vermont Public Radio) just called and said Neil Charnoff's piece about us will air today at about 9:35 AM. Nov. 5th, 2001 - The theme song is now online, just click here to hear it. We are offered $500 for 10 signed copies of the calendar by a guy from Las Vegas, Nevada. Nov. 6th - Today we set up a radio interview for Sunday afternoon with a major radio station in Japan, to be broadcast there on Monday, with Japanese translators. Nov. 7th, 2001 - Film crew all day here from NBC Today Show. The potluck supper at 6:30 PM was very well attended, and LOTS of good food. Nov. 8th - The Today Show wants to come back next wednesday and do a live broadcast when yesterdays tape airs, probably sometime between 7:30 - 9AM wednesday, Nov. 14th. The game show "To Tell The Truth" called and wants to do an episode featuring the "Men of Maple Corner" to be aired sometine in December. They want one "Man" to fly out to Hollywood for 2-3 days next week. We held a lottery of the 10 guys who want to go, and picked 3 names to send to the show. They will pick one of these to be the man to go. Nov. 10 - Saturday morning on WDEV 550 AM our "Theme Song" aired. Ken Squier (the DJ and station owner) asked listeners to tell him what they thought of the song. Nov. 11th - We had a meeting to talk about how many calendars to print. Printing will happen next week. At 5 PM we had the radio interview broadcast live in Nagana, Japan (about the size of Chicago), with a Japanese tranlator. Mr. May gave the history of the project, Mr. February talked about what his family and neighbors thought of it, and Mr. January sang the theme song solo. Nov. 13 - Added the toll free teephone number. Mr November's trip to Hollywood postponed due to flooding there. Rescheduled for Dec. 14th. 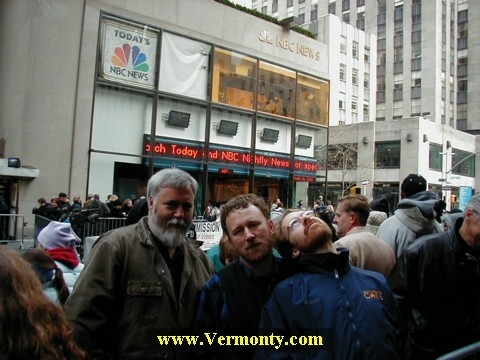 Nov. 14th - WOW The Today Show aired us for a full 10 minutes, part of it as a live satelite feed interview. We are totally overwhelmed with orders. The server goes down for a short while right after the show aired, but we moved the website to a larger one. Orders pour in all day. The Today Show is called back to do another story for tommorrow. 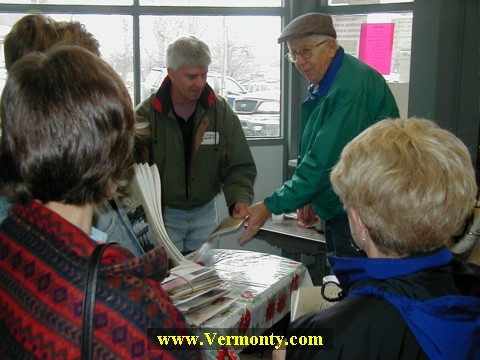 Nov. 15th - Today Show films live from Maple Corner at 8 AM, joined by the Women of Tamworth, NH via sattelite. Orders continue to pour in. The website sever is still overloaded, so we move the site to an even bigger server. The 800 # which practically melted down recovers midday. Film crews in PM from channel 5 and channel 7 interview townspeople, mostly at the Maple Corner Store. We set a shipping date of Nov. 21, though some of the earliest orders will ship sooner. Nov. 16, Friday - First run of calendars printed (10,000), and the second printing ordered (15,000). 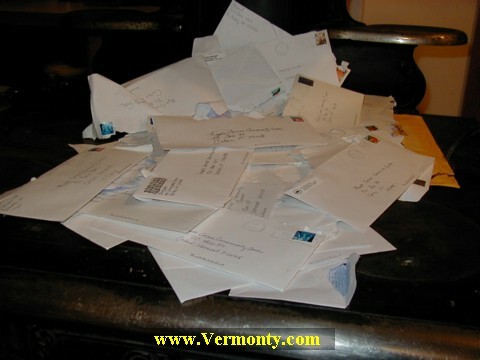 Nov. 17th - A heavy batch of mail, $10,440 as we start to get mail in that was sent after the Today Show aired. Also had a meeting this morning to decide who is going to be mailing all these calendars out. We have now sold calendars in every state! Nov. 20, 2001 - 1st print of the calendar delivered to Maple Corner, and it looks GREAT. Good job guys, and gals... And More Mail! Nov. 21 - Calendar delivered to some bookstores, and local orders. Now on sale at the Maple Corner Store. * "The Men" are being asked to participate in the opening of the Legislature. Mr. July reports that it should be during the week of Jan. 14-20th. Nov. 22 - A day off for Thanksgiving. We really need a break. 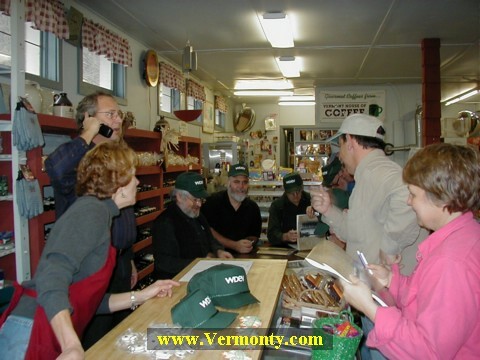 Nov.23, 2001 - Friday afternoon calendar signing in Burligton, VT with Matt, Craig, & Alden was mobbed. It went hours longer than planned. WCAX filmed part of it and showed it on the evening news. Nov. 24 - Saturday morning signing at the Maple Corner Store. People brought their own, and Bob sold about 200 more. We had to go an hour longer than planned. 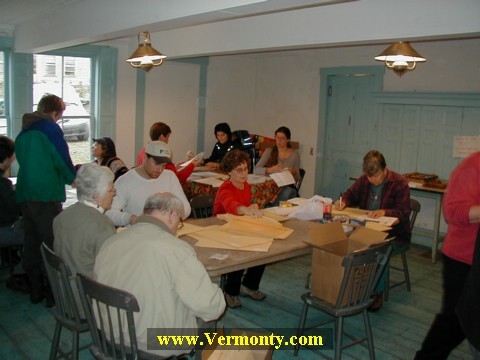 Nov. 25th - The envelope stuffing party to send out the first 3000 calendars is at the Maple Corner Community Center. Volunteers needed. Call Josie Miller. Nov. 26th - Orders from Korea and Australia! 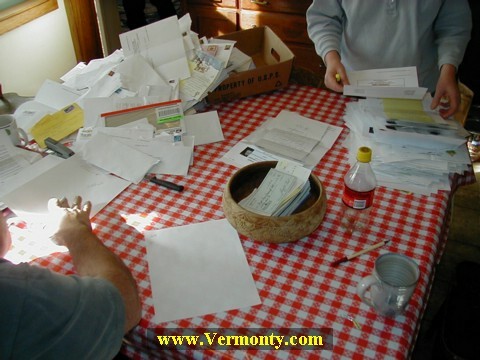 Nov. 28th - Another envelope stuffing party at the Community Center. After these, all orders will be handled by a shipping company, as we have sold over 25,000 calendars and the volunteers can't keep up. All orders received by Nov. 28 are expected to be shipped by Dec. 7. Our next printing run will be here about Dec.13, and start shipping soon after. Dec. 1st - saturday A busy day in Maple Corner. WDEV radio broadcast live segments from the Maple Corner Store from 9 AM - noon. As many as 11 of the guys were there at times, signing calendars for a packed house (or store). At noon we practiced a song and dance routine at the Community Center, followed by a Christmas wreath making party at 1 PM. Dec. 4th - Live radio interviews on Morning Radio program at WOKO Burlington. Tuesday Dec. 4th from 8:00 -9:00 AM. And Deb Fleishman from Adamant called and wants to interview as many MEN and WOMEN of Maple Corner as possible for her Goddard radio Program "local color". She will come to Maple Corner tonight from 8 to 9 PM and Tape the interview for broadcast Thursday, Dec. 6th at 11am. Dec. 6th - * Wood Art Gallery Montpelier. Calendar Signing at their illumination festival. Dec. 7th - Mass mailing of nearly all calendars sold through Dec. 5, so we are caught up with orders, but, again, we are out of calendars. The 3rd printing (of 10,000, for a total of 35,000 calendars) will be here about Dec. 11, and another mailing goes out Dec. 13. Dec. 12 - I am behind on the History writing, because we have all put so much time into getting those calendars mailed out. Contact me if I have left out something important. We have now sold about 32,000 calendars, and all are mailed or sent to bookstores. The mail seems to be really slow right now, with First Class taking a week to cross the country, sometimes a day or 2 more. Dec. 16 - Meeting at the Community Center to decide future plans, especially whether or not to do any more promoting. Most volunteers are fairly tired of the work, and feel we have sold enough. We still have to set a number for our fourth printing. Dec. 21 - Another mailing, the 3rd one this week. We are caught up with sending out orders received thru Dec 20th. All mail sent this week went Priority Mail. Dec. 22 - Signing at the Berlin Mall sponsored by Capital Stationers. Dec. 28th - Mailed out all orders received by yesterday, and all returns with bad, and now fixed addresses. We are really caught up and can relax for a moment after the intense Christmas rush. Jan. 3rd - Jamie leaves and Chris Miller takes over customer service, same e-mail address and phone, see above. Calendars keep going out, mailings about twice/week. The building committee met to talk about what work to proceed with, and to develop a recommendation of what to do with excess money. Jan. 9 - Received from Vermont State Rep. Jim Masland , Thetford: I introduced Joint House Resolution 160 honoring the Men of Maple Corner. It passed the House today. The Secretary of State's Office has requested that I provide them with the correct names and addresses of the 13 Men. You can read the resolution on line at the www.leg.state.vt.us or click here for text. Feb. 20? 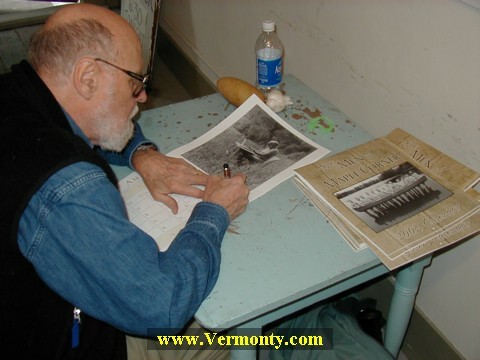 - The newest issue of Vermont Life has a great article about the calendar, written by world famous MariaLisa Calta. Mar. 1- Sally Jessie Raphael offered to fly the guys to New York City to be on her show. 4 of the guys decided to go: Mr.'s February, May, and both Novembers. Mar. 5 - Mr. Feb. and Mr. May are flown to NYC from Florida, and the Novembers from Vermont, where we are all picked up by a driver and taken to the Pennsylvania Hotel, in the shadow of the Empire State Building. Mar. 6 - We all get up early wednesday morning and take a taxi uptown to the Today Show, where we give 4 copies of the calendar to Al Roker on the air. After breakfast we go back to the hotel, and then spend the day at the Sally Show, after which a limo takes us to the airport and we fly back to Vermont.